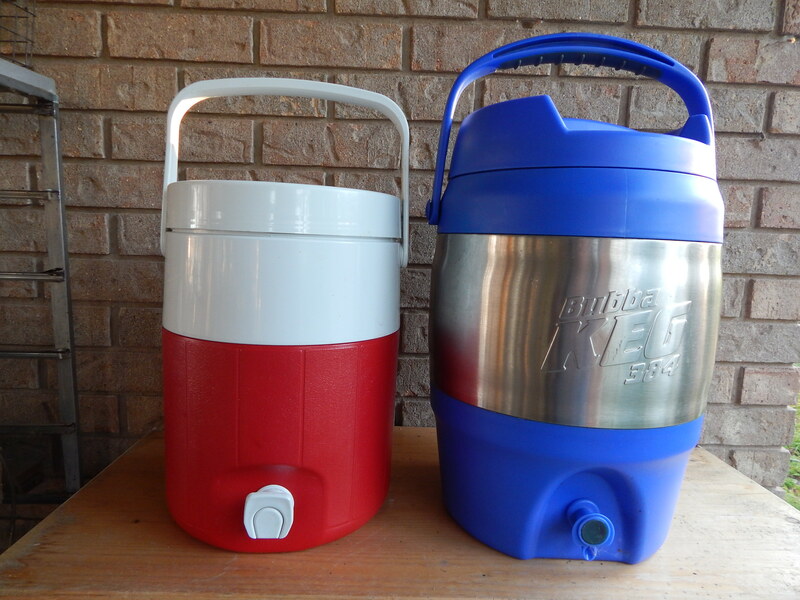 A 2-gallon and a 3-gallon beverage cooler. The 2-gallon (~8-L) cooler can be used to mash 4.0 lbs. (1.8 kg) of grain. 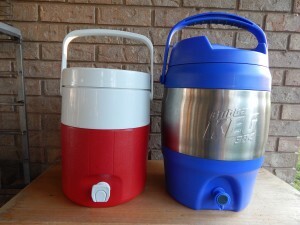 The 3-gallon (11-L) cooler can be used to mash 6.0 lbs. (2.7 kg) of grain. There are many different ways to approach a partial mash. In two previous articles, I discussed the rationale for partial mashing and one method of performing a partial mash — “steeping” the grains in a grain bag, then placing them in a colander over the brewpot and rinsing them. This works well for partial mashes with amounts of grain up to about 4 lbs. (~2 kg). Above that amount, the colander method becomes more difficult. Unless you have an enormous colander, the bag will overflow it and you’re more likely to drip wort everywhere. For larger partial mashes, I like to use what I call countertop partial mashing. Countertop partial mashing uses either a 2-gallon (~ 8-L) or 3-gallon (~11-L) beverage cooler as the lauter tun, the vessel that holds the mash while the sweet wort is separated from the spent grains. An insulated beverage cooler — the type with a spigot at the bottom, for holding cold or hot drinks at outdoor events — can be used as either just the lauter tun or as both the mash and lauter tun. For coolers up to 5 gallons (~20 L), simply lining them with a large steeping bag is sufficient to separate the wort from the spent grains. (If you want to get fancy, you could install a manifold, as with a full-sized cooler-based lauter tun.) This method delivers between 3 and 4 gallons (~10–15 L) of wort, to which malt extract can be added. This wort can be boiled on a stovetop, the chilled, transferred to a fermenter and diluted with cool water to 5 gallons (19 L) of wort. You can mash in the cooler and let the insulation keep the temperature relatively steady, if you’d like. Or you can mash in your brewpot, and transfer the bag to the cooler after the mash. At a minimum, this will allow you to hold the mash temperature more steady and perform a mash out. Or, you can do a step mash, if the recipe requires it. I’ve found that a 3-gallon (11-L) insulated cooler will hold up to 6.0 lbs. (2.7 kg) of grain, and the temperature drops a little less than if I use a 2-gallon (8-L) cooler, which holds up to 4.0 lbs. (1.8 kg) of grain. On the other hand, if I’m going to mash out or step mash, I’ll go with the 4.0 lbs. (1.8 kg) of grain in the 2-gallon (8-L) cooler as it’s easier (and less messy) to lift the grain bag out of the brewpot into the cooler. After the mash, the next step is recirculation. If you mashed in your brewpot, lift the bag out of the brewpot and place it in the cooler. Then scoop or gently pour the wort from your brewpot over the grains. Once the mash is in the cooler, draw off 1 or 2 cups of wort from the spigot and pour it back on top of the grain bed. By doing this, you’ll let the grain bed filter out little bits of grain solids from the wort. Repeat this until the wort clears somewhat or you have recirculated 3 qts. (3 L). The next step is to collect the wort. There are two ways to do this. After reciruculation, have roughly 5 qts. (5 L) of sparge water heated to 180–190 °F (82–88 °C). Run the first wort off by collecting a couple cups from the spigot and pouring the wort in your brewpot. Repeat until all the wort has been run off. Then, stir the hot sparge water into the grain bed such that the mash occupies the same volume as it did originally. Recirculate the wort again and run off the second wort. You should be heating the wort in your brewpot while you are collecting it. If you mash 4.0 lbs. (1.8 kg) of grains in the 2-gallon (8-L) cooler, you should collect about 10 qts. (10 L) of wort (just short of 3 gallons). If you mashed 6.0 lbs. (2.7 kg) of grains in the 3-gallon (11-L) cooler, you should collect about 15 qts. (15 L) of wort (right around 4 gallons). In both cases, the grain bed was sparged completely, and your wort should be in the 9–10 °Plato range (SG 1.036–1.040). The exact wort density depends on how finely the grains were crushed and other variables. With this method, you complete wort collection a bit faster, but you still have to heat the wort to a boil. You can be doing this while collecting wort in the next method, so the time savings isn’t really that much. As with the batch sparge option, you should have roughly 5 qts. (5 L) of sparge water heated to 180–190 °F (82–88 °C), or perhaps close to 170 °F (77 °C) if you mahsed in your kettle and mashed out. To collect your wort via the continuous sparging method, collect one or two cups of wort from the spigot, then add this same amount of sparge water to the top of the grain bed. Repeat until you’ve collected all of the wort. When you add sparge water to the top of the grain bed, pour as gently as possible. You can place a large spoon or small plate in the cooler and pour the water onto that, as an option. When you run out of sparge water, just drain the rest of the wort from the cooler. You should collect the same amounts as described in the batch sparge section. If you want to try to get the highest extract efficiency possible, collect the wort over 60 minutes (or up to 90 minutes, if you have the time). To do this, wait in between rounds of drawing off wort from the cooler. Draw off the wort, place it in your kettle and add the sparge water, then wait for a short amount of time before collecting the next bit. How much time depends on the size of your mash and the time you intend to sparge. If you’re collecting 10 qts. (10 L) over 60 minutes, collect a cup (8 oz./240 mL) of wort every 1.5 minutes. While you’re collecting the wort, you should be heating it. Watch the temperature and adjust the heating rate so that, if possible, your wort comes to a boil right as wort collection ends. From this point on, add water to your brewpot if you want your pre-boil volume to be larger. Add the amount of malt extract called for in the recipe (perhaps withholding some of it for the end of the boil) and proceed as you would with any 5.0-gallon (19-L) stovetop extract brew. You can wait until the grain cools down a bit before putting in in the trash (or composting it), but don’t let the cooler sit overnight before cleaning it. It will smell terrible. A few of the recipes on this website are formulated with this method in mind. These are Colby House Porter, Beelzeboss (“saison” brewed with Mt. Dew), Fimbulvinter Øl (winter warmer), and “Freya’s” Eyes (golden ale). This week, I’ll post countertop partial mash versions of some of my favorite recipes.